Learn How to Get Rid of Basement Smell from our smell removal guide and keep your basement smelling clean and fresh without spending a fortune. A smell free basement is also a sign of a healthy basement. So get the basement smell out because it’s a matter of your health and we do wish you well. Basements are a great place for storage and recreational activity. Unfortunately, your basement is likely to develop a moldy odor with time that can be difficult to eliminate. To make matters worse, the musty smell can permeate items that you have in storage to permanently damage them. So getting the musty smell out should be a priority, because if you don’t take action, it will start migrating up to your living space and your whole home will eventually become smelly. The basement moldy odor can result from several sources. Firstly, there are numerous microorganisms living in the soil beneath your basement. They emit smelly volatile organic chemicals (VOCs) that can easily enter the basement via cracks and porous floors. Secondly, dark damp basements with poor ventilation also provide a great environment for mold to grow and release moldy odors. If you have a water leak, it will enable the mold to thrive further and result in even greater basement smells. The good news is that musty basement smell can be eliminated so you don’t have to let it ruin your possessions and stop you enjoying your lovely home. By utilizing our simple and informative smell removal guide, you will learn how to get rid of smell in basements from smell experts, take immediate action to rid smell, and Smell the Difference! The first step to get basement smell out is to eliminate and control the source of the musty basement smell so it doesn’t get worse. Inspect your basement walls and floors thoroughly for any cracks or holes that may be allowing volatile organic emissions from microorganisms to enter your basement or causing water leakage. If you find cracks, simply fill in the small ones with expanding foam or putty. If there are larger cracks or missing wall, repair them if you are handy or call in an expert. The floors can also be waterproofed for further protection against basement smell. Failure to control smell can transform a musty basement into an uninhabitable and unsafe basement. If you have concrete walls or floors in your basement, use a fairly h4 bleach/water solution to spray down all the concrete surfaces. Concrete is a porous surface and the mold that causes a musty basement smell can live under the surface. The antibacterial properties of the bleach will kill mold, one of the potential sources of musty smell in basement. If you have any articles that have absorbed the moldy smell, remove them and let them air out in the sun as long as possible. Upholstery and clothing are very good at absorbing and retaining musty basement smell. Any fabrics that can be washed should be in hot water. You can also use ODOREZE™ Natural Laundry Deodorizing Additive to get rid of really stubborn smells from clothing by soaking them in it prior to washing or adding to your laundry. The second step in basement smell removal is to follow the recommendations below to get the smell out using professional strength SMELLEZE™ Smell Removers that rid smell without masking it with harmful fragrances. This is a proven green deodorizer that has been used successfully for over 20 years and recommended by thousands of people all over the world. Do this by sprinkling SMELLEZE™ Eco General Purpose Deodorizer Granules (only $12.99) on concrete basement floors. If you have carpeting, use SMELLEZE™ Eco Carpet Deodorizer Powder (only $12.99). Leave on the floor for a few hours or overnight (longer the better) to draw the smell out of the basement floor and to eliminate it before it gets released into the air. Then simply vacuum or sweep up and discard. You can also follow the same procedure to get smell out of upholstery, furniture and clothing. Do this by simply placing the SMELLEZE™ Reusable Basement Deodorizer Pouches (only $12.99) in areas with the moldy odor and smell the difference. This smell remover attracts basement musty smell like a h4 magnet, absorbs it like a super absorbent sponge, and eliminates it without masking with harmful fragrances. Using a fan and opening doors and windows will accelerate the basement smell removal process. In addition, you can hang SMELLEZE™ smell remover pouches on the cold air return side of your furnace duct where the paper filter resides to prevent basement smells from going up to your living areas. If the basement smell is already in the living spaces, you can place SMELLEZE™ pouches on your return vents in your home to continuously filter out the basement odor and harmful pollutants as your air recirculates. As mentioned earlier, mold is frequently the cause of musty basement smell. After you kill any visible mold on surfaces such as walls and floor, it’s also important to kill and prevent airborne mold and spores. This is simply done by replacing any light bulbs you have in the basement with SANIBULB™ Air Sanitizer & Purifier CFL Bulbs. SANIBULB™ will sanitize your air by killing various microorganisms such as mold spores in addition to bacteria, viruses, fungi, and dust mites without the use of any harmful chemical sanitizers. As an added benefit, it will also reduce your energy consumption by 75% and save you money! 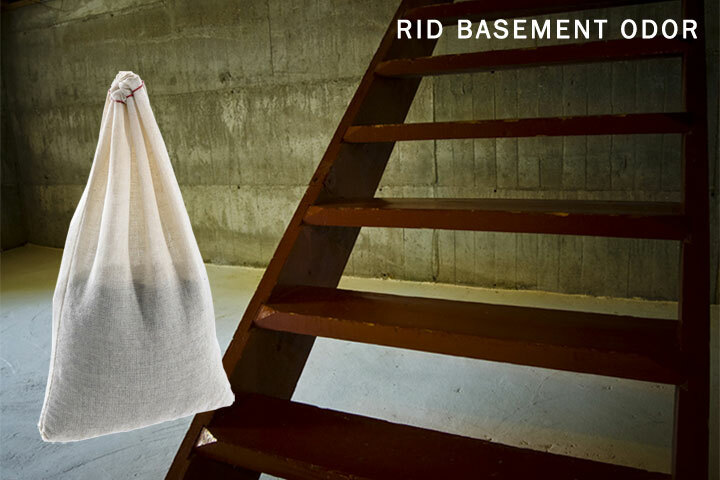 Once you have completed the hard work of eliminating the musty basement smell, it’s important to take the following proactive steps to prevent the basement smell problem from reappearing. Improve the ventilation in your basement by installing an exhaust fan. If your basement has windows, use window fans on exhaust to efficiently vent the basement. Open the windows and doors when the weather is pleasant to let fresh air and sunlight in. Air ducts can harbor odor, mold, allergens and dust. Have them cleaned out regularly by a professional duct cleaning company to help keep the odor from reappearing because moisture and contaminants can seep into air vents to generate a musty basement smell. Invest in an efficient dehumidifier if your basement is particularly damp to eliminate excess humidity in the air. Since majority of musty basement smells are caused directly or indirectly by excess moisture and improper ventilation, this will go a long way to help prevent basement smell. We recommend using MOISTURESORB™ Reusable Moisture Removal Pouches for just $12.99 to do the job inexpensively. Sometimes, a smell is just a smell. It can be unpleasant but nothing to worry about. However, other times, the smell is also an early warning sign of a potential health hazard. In the case of a musty basement smell, it’s probably a sign of mold that can be hazardous to your health. And just because you don’t see the mold doesn’t mean it doesn’t exist. For instance, it could be hidden inside the walls. Avoid masking musty basement smell with vanilla or harmful commercial fragrances. Covering-up basement smells never really eliminates the odor, it just overwhelms your nose into detecting the fragrance instead. The smell will likely return when the fragrance wears out. There are also times when fragrances will react with the basement smell to create even more obnoxious new smells that are worse than the original smell. Nature intended our sense of smell to provide an early warning sign for toxic chemicals we are exposed to so we can take action to avoid them. In the case of a musty basement smell, it’s probably a sign of mold that can be hazardous to your health. And just because you don’t see the mold doesn’t mean it doesn’t exist. For instance, it could be hidden inside the walls. So it’s better to really eliminate the problem and odor instead of using fragrances. If you decide to use vinegar, consider that it is basically acetic acid. It can react with and damage certain products and will leave an odor of it’s own. Do you really want to replace one smell problem with another? There is some misunderstanding about the use of charcoal briquettes for smell removal. It’s absorbency is very low and effectiveness marginal. What actually works better is activated carbon which is used commercially but that can get expensive and is hard to get in small quantities to get rid of basement smells. Best to save the charcoal briquettes for your next BBQ! While some commonly recommended home remedies for smell removal may help marginally in some mild smell problems, they are ineffective for the most part. It’s good to remember that household items such as vinegar, vanilla, charcoal briquettes are not designed to be smell eliminators so the results will often be disappointing and you could lose precious time. Since you will become immune to smell with time, you may think it’s getting better and risk long term exposure to some chemical smells that can be harmful without knowing. Since baking soda is alkaline (base) and vinegar is an acid, mixing the two just neutralizes each other so the resulting solution is not effective at smell removal. Basically, mixing an acid and a base pretty much results in salt and water. Thanks for the great advise. SMELLEZE really works great! I would recommend using the SMELLEZE Formaldehyde Smell Removal Pouches or Granules. This product is designed to absorb and eliminate the formaldehyde chemical odor. I would recommend using Smelleze® Reusable Formaldehyde Smell Deodorizer Pouches to eliminate unpleasant airborne formaldehyde odor. For a breath of fresh air, simply place Smelleze® pouches in all areas or spaces with the bad odor and smell the difference. Use one pouch for every 150 square feet of area treated and smell the difference. need to open the pouches for them to be effective? You open the plastic bag that it comes in but not the cotton bag with the product in it. my daughter has a smell that you notice going down her basement steps. that is where it is the most noticible. i don’t know if it is the carpet, the ceiling, (she has dropped celing), or in the walls. she also has a vent that is in the ceiling at the bottom of the steps. i cannot pinpoiint where it is coming from. we thought it might be in the laundry room, but the smell is the strongest when you are coming down the steps. if it is in the walls, and no cracks, what then? If it is in the walls i would recommend using our SMELLEZE™ Reusable Basement Deodorizer Pouches to absorb the odors invading the air. Thanks for the information, will try them. Where can I purchase the products mention? You can purchase the products at http://noodor.com or you can give us a call at 770-667-8621 and we can take your order over the phone. Where can I buy these at? I have a 1900 Sq ft basement with concrete block walls that smells like mildew. House built in 1969. Have just put in new, insulated garage access door but crank out windows (6) are original so it’s not airtight. Have cut back vegetation and trees, will install dehumidifier. How many/and which product from NoOdor? Where can I buy near Charlotte N.C. Thanks! Each pouch will cover 150 square feet, so I would order at least 13 pouches. Also, our products are not sold in stores, but you can order from our website at http://www.noodor.com. I would recommend using Smelleze® Reusable Basement Smell Deodorizer Pouches to eliminate the odor problems. My kids have a full basement in their home. The childrens bedrooms are in the basement. In the winter their basement takes on a nasty almost chemical smell. It doesn’t smell like rotten eggs. They did have an elderly dog that was ill and piddled in the basement from time to time. It is carpeted and they had them professionally shampooed in the past. The dog has since passed. The smell seems to have moved to their upstairs but is very strong in the basement and the basement feels damp. Do you think the smell is urine or a combination of moisture and urine coming back out of the cement floors under the carpet. Any recommendations? I would recommend using Smelleze® Reusable Basement Smell Deodorizer Pouches to eliminate basement odor problems. For a breath of fresh air, simply place Smelleze® pouches in your basement to absorb and eliminate the odor. If you have a HVAC system, you may also place the Smelleze® pouches on your return air vents, and/or in front of the air return duct in your furnace to filter the odors out faster. Overall, use one pouch for each separate area (e.g. cabinets) or every 150 square feet of open area (e.g. rooms) and smell the difference. You can use additional pouches for areas with severe odors.